This is how at a Tim Book Two book reading I ended up looking after the pop up record shop at the Poetry Club in Partick, Glasgow whilst Tim Burgess signed books and Vinyl records in another room and Nick got 2 tickets for the Saturday at Electric Fields out of his van for me and Lorna. That night we went home with new vinyl, a book, 2 Tim Peaks plectrums, a Screamadelica-era Primal Scream t-shirt and the above mentioned 2 tickets for Electric Fields. Not a bad end to the night where a book reading was the only certainty on the cards. 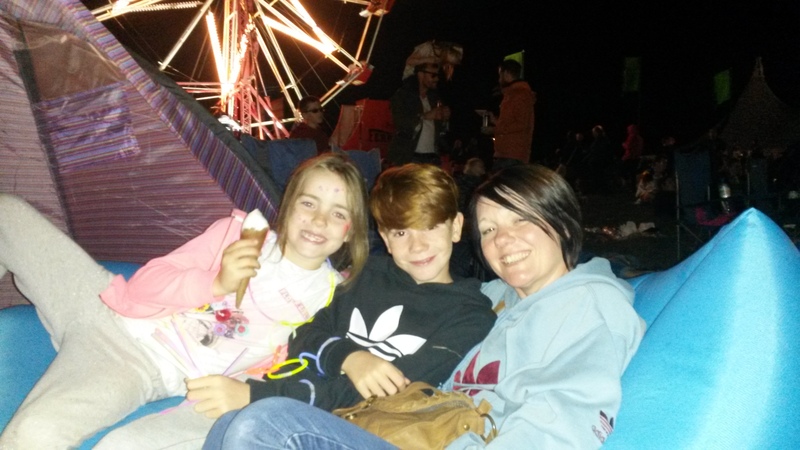 For the past few years we, as a family of four, have been regulars at Wickerman. Last year we also had an eye on Electric Fields as The Twilight Sad were doing an acoustic set. The timing was not ideal and in the end we didn’t go. This year we were going. Drumlanrig Castle is to be found on the Queensbury Estate in Dumfries and Galloway, about 70 miles South of Glasgow. 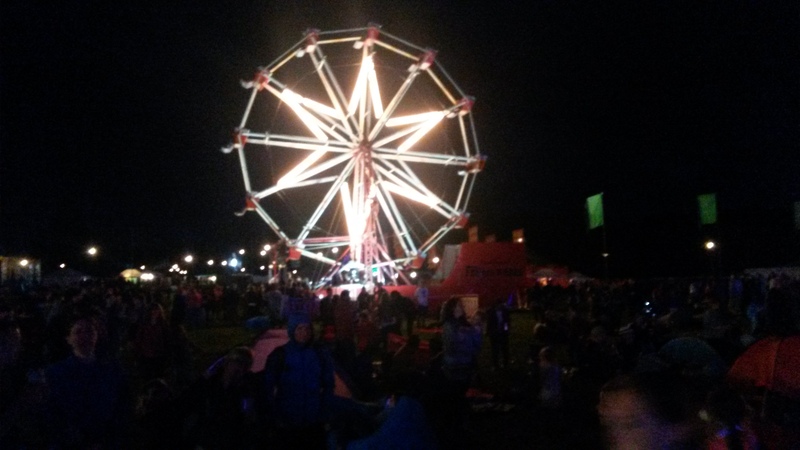 It has been the location of the Electric Fields 1 day music festival for the past couple of years, but this year the organisers have stepped out of their comfort zone and increased the festival to 2 days and increased the tickets from 1000 to 5000. A big step. The tickets we had been given were for the Saturday. The headliners for that day were Primal Scream with personal favourites of mine, The Twilight Sad and Steve Mason also on the bill. This small Scottish Music Festival in a rural location was going to be the home to 3 acts I would happily have paid money to see. We decided to take the kids with us. The drive from Armadale to the festival would take 1hr and 37mins according to the Google route planner, so we set off at 11 o’clock and lo and behold we arrived at 12:40. A few miles past Abington services we had left the M74 and proceeded to wind our way through the Leadhills towards our destination. The route takes us a drive through said hills on a road almost empty of cars with signs warning drivers of motorised vehicles to be aware of the young lambs. At no time did we get snarled up in traffic, in fact we began to doubt our guide as she told us our destination was to be found “1/4 of a mile ahead on the left”. Then we entered the single track approach to the castle. 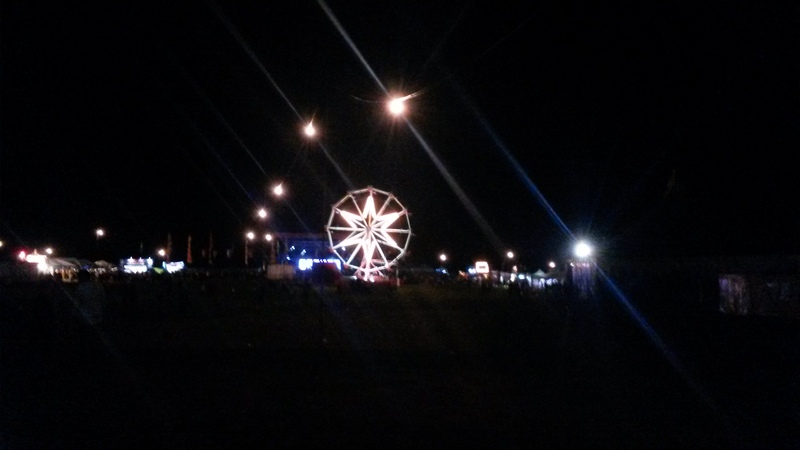 There had not been a single sign directing revellers to the site, but that is not a bad thing. Finding Electric Fields had been part of the adventure. This festival is small enough to avoid the over authoritative jobsworth security that accompanies other festivals and by the time we have parked up in the field next to the River Nith, where later on today the odd group of festival revellers and middle aged mothers and fathers with kids would be paddling in the cool water, all of what we had left behind had been forgotten. We wander over to the blue portakabin to exchange our tickets for our festival wrist bands and buy a lanyard with stage timings. “That’ll be double for 2. £8” says the young student type behind the counter in an apologetic tone. A few sandwiches seated beside the car, a game of passy with a football between dad and kids and we’re off into the arena. A yellow welcome on two fronts. As we walk up towards the entrance to the arena I message Stevie, a grizzled old Glastonbury veteran with countless gigs and festivals under his belt and we agree that we are making our way in to see Colonel Mustard And The Dijon 5 on the main stage. We’d meet there. The sun is beating down and the day is warm. We get to the bag check area but are quickly in. We have arrived. The arena looks to be the length and width of a few football pitches with kids entertainment located on the left and right of the entrance, before it opens up into a festival arena housing 3 music tents in the form Tim Peaks, Sneaky Pete’s and the Stewart Cruickshank tent. Straight ahead is the “big” wheel which is actually not that big which is in turn in keeping with the size of this event. Beyond this we can see the Main Stage where Colonel Mustard & The Dijon 5 are dishing out their own sonic sunshine. This troop of yellow clad individuals have been building a steady following in Glasgow and beyond. On selecting a clear area to spread our picnic blanket, we settle down to enjoy the last 2 numbers from the Colonel and his friends. A blow up swan paddling pool is introduced at the front of the crowd and a Glastonbury-esque crowd surfing escapade ensues, before all in attendance are asked to turn to the nearest person and “hug it out”. Perfect festival fodder. From the off, this place feels good. At this point I spot Stevie standing a few feet in front of us. He had come down on the Friday and was camping in the small area at the back of the aforementioned portakabins with his partner Gwen, the kids and some friends. The Charlatans had been headlining on the Friday and I was keen to hear about this and generally how the Friday had panned out. “I just saw 3 bands.” Said Stevie. “What happened? Didn’t you come down until late?” I replied. I’m sorry. I laughed out loud. That’s not a lol moment. I actually laughed out loud. He explained that he had realised 5 miles from the castle grounds that he hadn’t picked up the tickets. 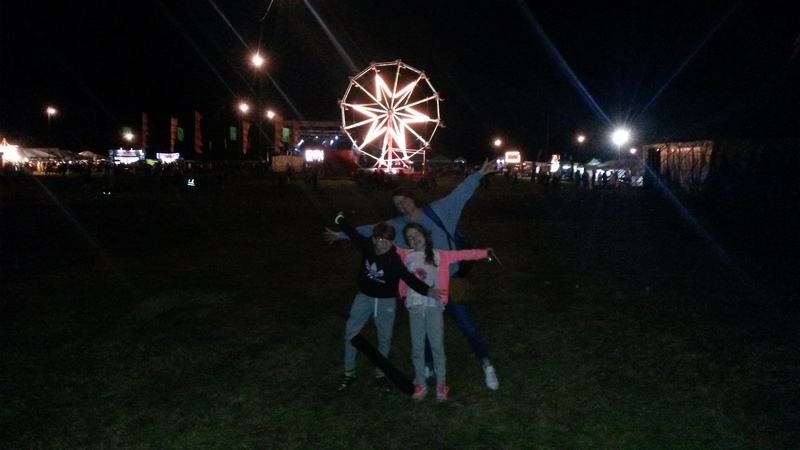 He had then dropped everyone off at the campsite gates, leaving them with enough chairs, the tent and some water, before completing the 3hr round trip to get the tickets and bring them back down. I advise him not to feel too bad about it as once he’s been to a few festivals he’ll get the hang of it………”forgot the tickets”….ha! SAY nominee, C Duncan followed Colonel Mustard & the Dijon 5, but as I stated earlier, we had the kids. At 7 and 11, the sight of the LAY SACs, or inflatable sleeping bags, had proven too much to bare and whilst Lorna was away exploring the festival site, they both played me good and proper. 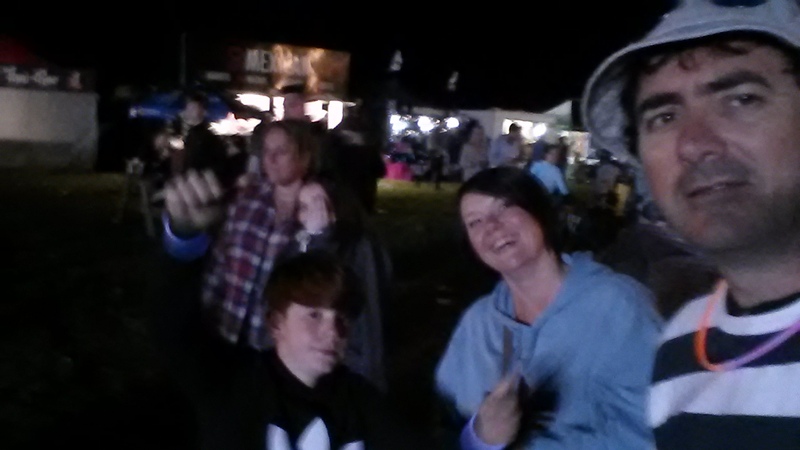 The outcome was that whilst C Duncan did his thing on the Main Stage, I was doing the lunatic dance moves reserved for middle aged dads trying to pacify the kids by capturing still air in a 7ft long blue nylon sleeping bag. Yip, there is no way to do this and look cool. At least Logan enjoyed it. Luckily there is no video evidence to back up this claim. For what it’s worth C Duncan’s performance sounded good and I’ll probably give him another listen some time. Don’t let this picture fool you. By the time Admiral Fallow came on stage, the scene had changed. Seemingly it’s impossible to stand up from one of these without “accidentally” pushing your sibling on the head or equally “accidentally” kicking them on the shin. So it was that, with a heavy heart I had to grab the outsized blue jumping bean, turn my back on a band I really wanted to see and head off to find something to entertain the family. When we arrive, Blueprint Blue are confidently in full flow. Front man Elliot Hayward explains that this is the first time they have performed outside London, before taking the lead from the swooshing snare drum sound provided by drummer Melissa Rigby and joining bass guitarist Huw Webb in another melodic journey into their sonic world. From my vantage point at the back of the tent they seem musically mature for their years, with a sound that has it’s roots in another age, it’s of no surprise to hear that their their influences include, The Grateful Dead, Neil Young and Jackson Browne. I find myself wondering if they have bitten off more than they can chew in trying to bring this retro sound to the modern public, but I’m quickly convinced that they have enough talent and confidence to give it a good try. We stay for 4 songs and see the end of their set when the assembled audience warmly clap and holler their approval. Definitely worth another listen so get over here or here. I think about wandering over for a cup of Tim Peaks coffee but it’s just too hot so I wave over to Nick by way of a thanks for the tickets and leave the shelter of the big red tent entering the open air again where we bump into Stevie, Gwen and family seated on high backed bean bag chairs in the shade of the Crew festival support tent, where everything from water to suntan cream can be sourced for a small donation. We pass the time of day talking about Iceland which they had visited earlier this summer and will be our destination in October, “buy” the last of the suntan cream available from the Crew volunteers, before packing up and wandering out of the arena to give the kids a chance to play on the adventure playground attached to Drumlanrig Castle. We have timed this almost to perfection as we arrive just as the attendant is closing the park for the night, so we head off to the car park (field) to gather our stuff for the rest of the afternoon and the evening’s headline set. We return to the arena and set up for the night erecting our massive sun tent, which obviously looks a lot smaller on the packet photo of one in use on a beach. The picnic blanket is unrolled in front and the luminous blue Lay Sac is gracefully inflated by yours truly before being placed in front of the shade providing half tent. All the comforts of home. Well almost. It’s obvious that Logan and Fearne are not in the best of moods as they have been denied 15 mins of fun in the park. Obviously we have planned this. A quick family pow wow and a few air clearing truths about our commitment to a happy family life are delivered before we witness the arrival of Steve Mason and his band of brothers. The ex-Beta Band front man ambles out onto the stage wearing a green smock like parka with a brown leather belt and a pair of goggle sunglasses. The image is that of a modern day football casual-monk. He introduces his band and pays particular attention to the keyboard player letting everyone know he got married the previous day, before entering into a solo career spanning set. This performance is loaded with songs from Meet The Humans, his recently released album, including (as I remember it) Planet Sizes, Another Day and Water Bored. He also plays some older tunes, a favourite of mine being Seen It All Before from his 2nd solo album Monkey Minds In The Devil’s Time. (I stand to be corrected on this one, but as I remember it this was played). Steve Mason shifts from guitar to hand held percussion instrument, the name of which I don’t know but it wasn’t a tambourine or a cowbell, and starts prowling about the center stage. You can sense a modicum of agitation entering his demeanor and it’s not just down to the fact that at various times throughout the set he can be seen adjusting the belt whilst commenting on his “wardrobe malfunctions”. Nope he is definitely warming up for something. Meanwhile, in keeping with the family festival idea, I have made my way to the front of the stage with Fearne in tow and she is on my shoulders for the introductory words spoken from Steve, “I wish this wasn’t a song that was relevant today, but it is”, before launching into the anarchic call to arms of Fight Them Back with it’s acerbic announcement at the end of the first verse, “I feel sad to say the words here that must fall, Upon my lips, you see I f*cking hate you all” and it’s catchy chorus refrain, “You get up, fight them back A fist, a boot and a baseball bat”. These words are obviously aimed at the capitalist establishment so hated by our entertainer. I can feel Fearne dancing along whilst I digest the meaning of the song Lyrics. A true family experience. Electric Fields hasn’t pulled it’s punches in it’s choice of acts and on this evidence the acts certainly haven’t toned down their message. Everyone wants to be here and no-one is leaving. The break between Steve Mason and the next act on the Main Stage calls for a wander around and I make my way over to the Sneaky Pete‘s tent with Logan. This tent is Electric Fields answer to a “dance tent” with DJs playing all day curated by Edinburgh’s Sneaky Pete’s club night. Inside Juice dj’s are spinning some discs and a mixture of middle aged mums and dads are dancing with their children. It’s a strange sight, but everyone is enjoying themselves. We depart and walk over to Tim Peaks again. This time it is full to bursting and the crowd is spilling out the open entrance. I check my lanyard and it tells me that Teen Canteen are playing. The sound of this Glasgow based all girl band can be heard over the heads of the significant crowd, but it’s no fun for a 4ft high son who is staring at backs and nothing else. We decide to return to our festival home to catch the start of The Twilight Sad. Fresh from a tour of North America supporting The Cure and before they embark on an equally long European tour supporting Robert Smith’s goth legends which will take them out to the end of the year, The Twilight Sad are the epitome of the hard working band who, after a decade of writing, recording, touring and starting all over again, have recently become an overnight success. Hailing from Kilsyth, they are rightly proud of their dark and foreboding work, whilst in lead singer James and his onstage presence in the manner of a peyote loaded shaman, communing with the spirits of the long departed, they put on a unique show hardly touched by any of their contemporaries. They had played an acoustic set last year at this young festival, but would this transfer to a sun soaked, late afternoon, festival appearance on the Main Stage? The band members move into position at their stations on the stage. James approaches the mike and looking at the orange globe in the sky, comments on the unusual situation where they were playing in the sunshine. As they launch into their opener, it is clear that emotions are running high. Shamanic shapes are being thrown around and in between lyrics, the front man appears to be having a heated argument with a twelve foot tall opponent hanging over him. To the uninitiated, this might be a bit unnerving, but this is what this band give you….everything whether you want it or not. By the end of their opening song, the sun has completed it’s retreat. For the next 45 minutes we are locked into a performance from a band at the top of their game. Between songs James thanks everyone for coming to see their band. This is a regular occurrence at TTS gigs, but there is an added authenticity to this one, then we are reminded of the true sadness behind today’s performance. Last January is played for The Lapelle’s front man who had recently passed away following an accident involving The Clyde on the eve of his 22nd Birthday. They were set to be performing on the Stuart Cruickshank stage and it was roundly believed that this would be their next step on a road to certain success if they wanted it. Their song Grab Life By had become an anthem already for this up and coming band. Once again the spirits can be seen to be bothering the lead singer of TTS but this time they are not invisible, the whole crowd can see the face of Gary Watson and as the song is brought to an end, looking to the sky and the sun which has decided to make a reappearance, James grabs for something that isn’t there and drops to his knees pulling his black t-shirt up to wipe his face and undoubtedly his tears. A little bit of Everything with the Family and Jim Gellatly. Next up is Everything Everything. Described as an Alternative Rock band from Manchester with leanings towards R&B, Electronica, Pop, Prog and Psych Rock, there has to be something here for everyone. There is a sense of anticipation building at the main stage. The crowd has swelled and the gaps between groups of enthusiastic Twilight Sad fans are being filled by new faces. The start is delayed as the stage is transformed from the dark grey openness of the unadorned lighting rigs and ground level audio monitors that had been on show for the daytime entertainment as, what had looked like slate monoliths, randomly arranged behind The Twilight Sad, are moved into place nearer the front of the stage. As the light in the arena is fading towards evening, Everything Everything, lead by front man Jonathan Higgins, take to the stage to a loud cheer and as the first electronically driven note rings out to drown out the crowd, the once grey slabs are ignited and with white hot light, the last of the evening is chased out of the air……but I want to see The Fat White Family, so with agreement from Lorna the matriarch of our group, me and Logan wander over to the Stuart Cruickshank Tent where they are playing. The tent is pretty much rammed, but there is room at the back which allows us to stand comfortably to see the performance. Stripped to the waist, lead singer Lias Kaci Saoud screams like a shamanic Jim Morrison whilst swilling from one of a number of Champagne bottles being shared around the stage and the barrier hugging fans. The last time I saw this level act and crowd interaction was when Amazing Snakeheads lead singer Dale Barclay took to the stage at Wickerman and this is no bad thing. Although I was keen to see Fat White Family, I have to admit that I didn’t know much of their material but this didn’t take anything away from our enjoyment and if evidence is needed, then take a look at the smile on Logan’s face. As nature took it’s toll, I had to take a short break which turned out to be fortuitous timing, as standing outside the entrance to the tent was the ever jovial and socially outgoing Jim Gellatly, who, in a short lived twitter conversation that morning, I had taken the opportunity to test the water on his approach-ability. He hadn’t warned me off so I walked over and said the words, “I said I’d say Hi…so, Hi.” He smiled a big smile and we hi fived before I turned to Logan and said ” job done, let’s go back in”. We return to the main stage to catch the end of Everything Everything. Lorna says that they have been well received by the youthful audience and as they bring their set to a close there is another enthusiastic cheer of appreciation. At this point I took a quick look at the lanyard around my neck and realised Everything Flows DJs were playing the Tim Peaks tent. I persuaded Stevie to come for a walk. Stevie, Gwen and the kids had joined our gathering around the time of the start of Everything Everything, so I wasn’t leaving Lorna alone with the kids, although there would have been no problem doing this as the atmosphere is one of friendly family fun in amongst the festival vibe we all know and love. Stevie and me wander up to Tim Peaks via the Sneaky Pete’s tent where Eclair Fifi is entertaining the more appreciative crowd. Over in Tim Peak’s a similarly appreciative crowd are enjoying the last remnants of a hit loaded set but as we arrive the last track has hit the decks and the choral strains of Movin’ On Up are ushering the gathered festival goers out towards the night’s headline set from the masters of reinvention, Primal Scream on the Main Stage. Come Together, enjoy together and leave together. Earlier in the week I had seen East Kilbride’s very own Reid brothers, AKA The Jesus & Mary Chain play a blistering set on their debut album, PsychoCandy’s, 30th anniversary tour. The album was recorded with a certain Bobby Gillespie on drums before he quit to concentrate on his other band Primal Scream, the same band that tonight will bring this exciting small festival to a close on the main stage. The ‘Scream open up with Movin’ On Up providing a seamless link from the Everything Flows DJ set and Tim Peak’s to the Main Stage, before treating everyone to a hit loaded set, mixing older tunes from Screamadelica in the shape of Loaded, Jailbird from Give Out But Don’t Give Up through to some choice tunes from Chaosmosis including Where The Light Gets In before playing my all time favourite live Scream song, Swaztika Eyes from 2000’s XTRMNTR. All through this set, a young Primal Scream fan ten yards in front of us, has been treating everyone to a faultless sing and dance along performance of his own. Music bridges the gap of generations and I’m pleased to report that both Logan and Fearne found it impossible to resist the beat and were enthusiastically dancing to the sounds and sights emanating from the Main Stage. All too soon the main set is finished and faced with a drive home, we pack up and bid farewell to Stevie, Gwen and their girls before making our way towards the exit. The lights of the stage have remained lit though and the crowd has not dispersed. It is obvious that an encore is on the cards and just as we reach the ‘big wheel’ the headliners take to the stage once again, finishing the weekend with an extended rendition of Come Together which the captivated crowd passionately echo back towards the stage. From our vantage point just in front of the ferris wheel, we as a family join in. Electric Fields may have been going for a relatively short period of time, but this little music festival tucked away in the hills of southwest Scotland has a lot to offer the most discerning of festival goers. As a fan of vinyl, I love the idea that this journey of discovery started in a pop up vinyl shop in Partick and ended…..well, let’s just leave the ending for another time eh?